Good evening. I created this one using Essence of Nature and Rose Tree stamp sets from Chocolate Baroque. The theme on this weeks Simon Says Stamp Challenge (Wed) is ‘Sparkle and Shine’ – so I have entered this one. The floral spray was stamped with Memento directly onto the card blank, avoiding the area of the central circle. 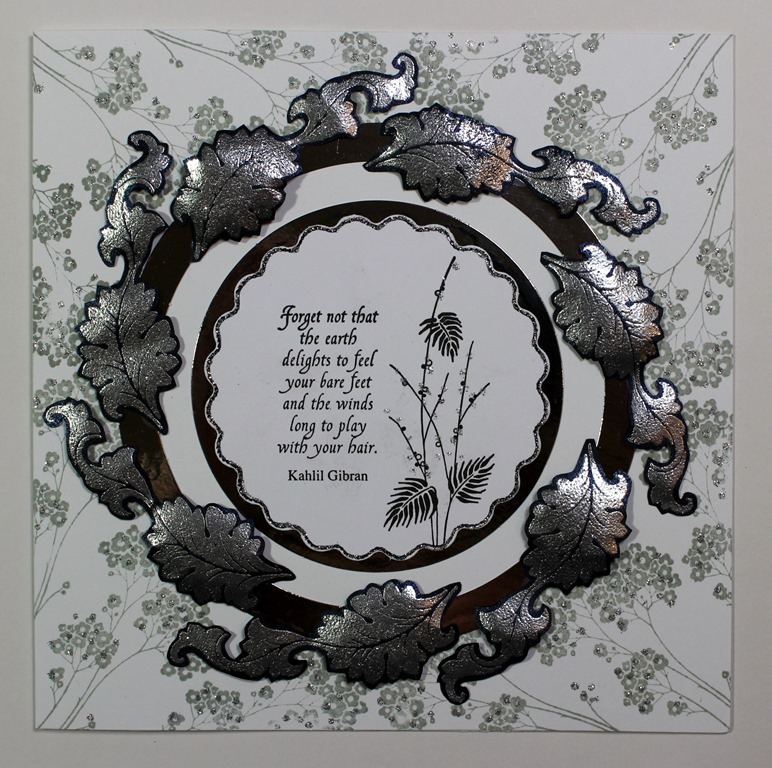 The leafy fern and sentiment were stamped onto the scalloped circle with Versafine. Frames and mat were glued to the card front. The leaves were stamped with Versamark onto black paper, embossed with silver powder and cut out. They were lightly shaped with a ball tool and glued in place with 3D glue gel for dimension. Finished with glitter glue for added sparkle. This entry was posted in Card Making, Chocolate Baroque, Hochanda, Paper Crafting, Stamping, Tattered Lace and tagged Anne Waller, Chocolate Baroque, Essence of Nature, Heatherwell Designs, Stamping, The Rose Tree by annewaller. Bookmark the permalink.